SCP-089, after transportation to the location of SCP-089-B's residence in order to perform Protocol M8. At such time as SCP-089-B is prepared to voluntarily execute Protocol M8, render to SCP-089-B any assistance as SCP-089-B may request in connection with SCP-089-B performing the following actions: inserting SCP-089-A into the cavity together with inflammable materials such as oiled wood or charcoal, then igniting them. The successful execution of Protocol M8 requires the voluntary compliance of SCP-089-B in a sober and uncoerced state. Likewise, SCP-089-A must be conscious and alert during the execution of the protocol. It is recommended that SCP-089-B be restrained (although not sedated) following ignition so as to avoid interference with the completion of the protocol, as the process is extremely painful and fatal to SCP-089-A. If SCP-089-B refuses to voluntarily execute Protocol M8 in accordance with the aforementioned specifications, MTF Mu-89 is to explain the prospective consequences of failing to successfully complete the protocol and make every effort to persuade SCP-089-B to cooperate. If MTF Mu-89’s best efforts to so persuade SCP-089-B are unsuccessful, SCP-089 is to be redesignated as Keter-class and Protocol M9 is to be executed (reference Document 089-M9). The use of intimidation, threats or mind-altering drugs or intoxicants in an effort to affect SCP-089-B's free will, and any attempt to complete Protocol M8 without SCP-089-B's participation or voluntary cooperation, or otherwise other than as described, are strictly prohibited since these measures invalidate the attempted completion of the protocol and are known to intensify the severity of the attendant Type-S Event. It is also recommended (although not a required part of Protocol M8) to cause the execution of step 2 of Protocol M8 to be accompanied by the sounding of horns and percussion instruments, as doing so may mask the sounds made by SCP-089-A during the execution of the protocol. Upon a successful execution of Protocol M8, the related Type-S Event generally begins to abate within 7 hours. 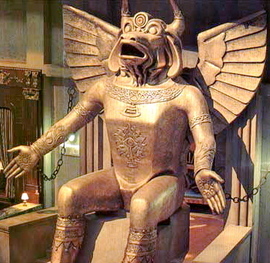 Description: SCP-089 is a glazed earthenware statue, approximately 3 meters in height, depicting a winged, bull-headed humanoid with an open mouth. The front of the statue’s torso is hinged and can be opened from the top to reveal a cavity, approximately 0.6 cubic meters in volume, and can be locked from the outside. The rear of the statue bears an inscription in a Canaanite language (possibly Punic).1 The statue dates from approximately the 2nd century BCE. Each locution event is followed, within a period of three to eleven days, by the commencement of a Type-S Event meeting the description given in the locution event, unless Protocol M8 has already been completed. Each Type-S event is an epidemic, natural disaster, mass hysteria involving genocide or other massacres, or other event involving extensive damage to property and loss of human lives over a period of time that continues until Protocol M8 is successfully completed. In the case of each documented locution event, the attendant Type-S Event, while significant, is limited to a geographic area that does not directly affect SCP-089-B. This has, in some documented cases, resulted in the pendency of a Type-S Event for an extended duration of time due to SCP-089-B’s unawareness of SCP-089 or of Protocol M8, or to SCP-089-B’s unwillingness to undertake Protocol M8 in order to arrest the Type-S Event. For each locution event, SCP-089-A is a healthy, unblemished human infant or child between eight months and six years of age, and SCP-089-B is that child’s natural mother. In all documented cases, at the time of the locution event SCP-089-A and -B are each alive and healthy, and experience a strong bond of trust and affection with each other. Following SCP-089-B’s placement of SCP-089-A in the cavity and the ignition of the inflammable materials, SCP-089-A will burn and be destroyed over a period of two to five hours. Memo to file from Dr. Garcia: While the role of SCP-089 in actually causing Type-S Events is unclear, experience has demonstrated that the prompt and precise application of Protocol M8 is effective in limiting the damage that they do. Dr. Patel has speculated that SCP-089 does not cause Type-S events, but merely anticipates them and provides a means to mitigate their effects. Outcome: Protocol M8 completed on day 29 after locution event. 66% of city's buildings destroyed. Outcome: Protocol M8 completed on day 1,363 after locution event. Massacres associated with uprising and its suppression, and attendant agricultural collapse, account for at least ██ million casualties. Type-S Event: Earthquake and volcanic eruption in ████ █████. Outcome: Protocol M8 executed within 31 hours of locution event. No tsunami resulted although geological models had anticipated that one would occur from a seismic event in that area. No fatalities. Type-S Event: Cyclone in ██████████. Outcome: Protocol M8 executed on day 49 after locution event. Casualties from flooding, disease and starvation estimated at ███ thousand. Outcome: Ongoing. Protocol M8 not yet executed. 1. Dr. ██████ translated an excerpt of the text as "Nightmare of Moloch! Moloch the loveless! Mental Moloch! Moloch the heavy judger of men!"